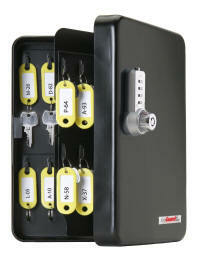 Lynnwood, WA - Why hassle with keys to secure and manage keys? 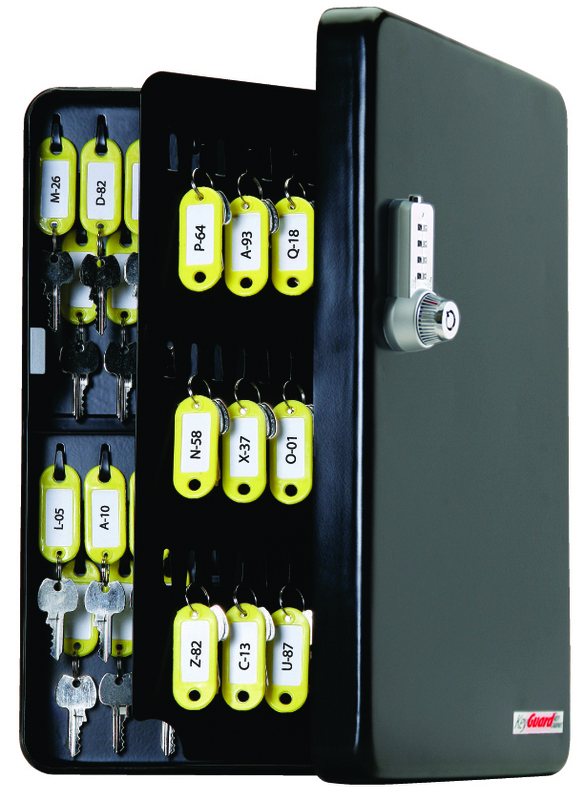 With the new line of durable and reliable combination key cabinets from FJM Security Products, you don’t have to. The durable KeyGuard Combination Key Cabinets are constructed entirely of heavy gauge steel, including the high capacity key hooks and continuous “piano” hinge. With mounting supplies and multi-colored key tags included in the box, this key cabinet is easy to install and easy to organize. 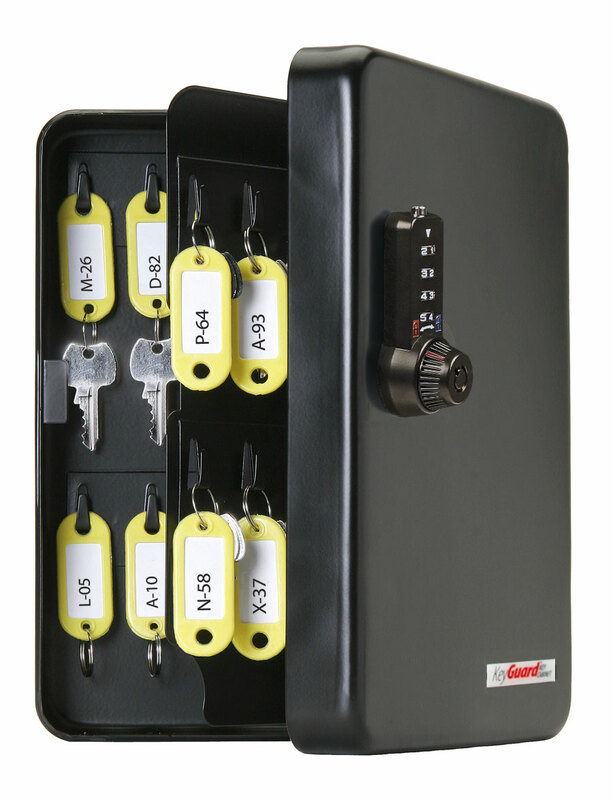 Available in 48 and 122 key models, the cabinets are secured by the Combi-Cam, a three-dial combination cam lock with 1,000 possible codes. The solid metal, three-dial Combi-Cam has been on the market for years as a solid performer in other applications without the reliability issues seen with other types of combination locks on key cabinets. Not only does Combi-Cam provide the convenience of keyless access, it also provides flexibility with easy-to-change combinations at any time. Consumers benefit from the variety of free resources available online such as replacement labels for the key tags, sign-out sheets and key location charts available at www.combination-key-cabinet.com. Why hassle with keys to secure and manage keys? KeyGuard's new line of key cabinets provide keyless convenience, durability and reliability at a competitive price. 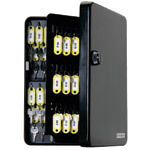 For more information contact FJM Security Products at (800) 654-1786, www.combination-key-cabinet.com. KeyGuard is a division of the FJM Security Products with other innovative security products including the Combi-Cam, Combi-Bolt, ShurLok Key Boxes, HitchSafe Key Vault and SOBO High Security Padlocks. 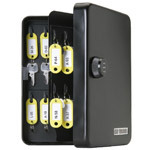 New Combination Key Cabinet model offers DUAL ACCESS ! Lynnwood, WA - FJM Security Products adds DUAL ACCESS offerings to their key cabinet line. With the dual access, one can use a combination OR a key to access the keys inside. The dual access can also be used as a manager function whereby the manager keeps the key, allows access to employees with combinations and if they lose the combination, quit, etc. the manager can override the combination with the key and change it to a new code. 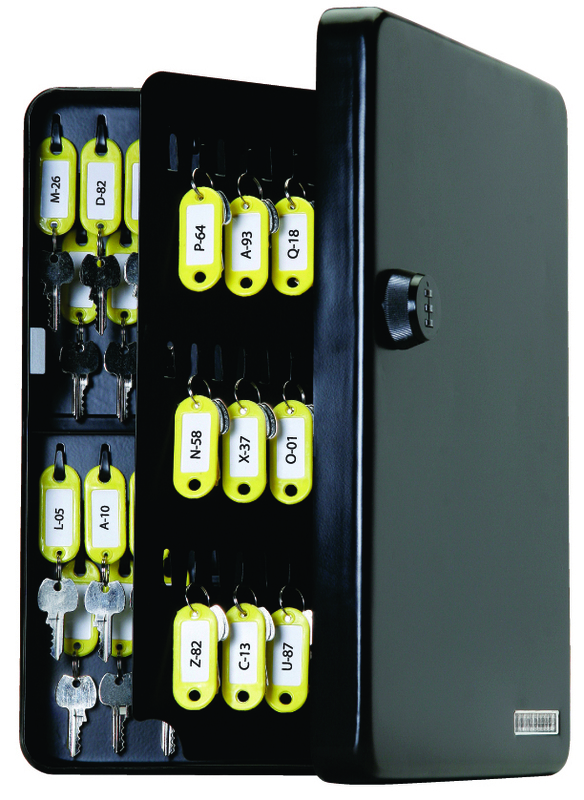 Dual Access Combination Key Cabinets come in 48 key hook and 122 key hook models. Included with the product is the mounting hardware and 24 and 64 key tags respectively. Lynnwood, WA - FJM Security Products adds keyed key cabinets to our product offerings. Although we specialize in combination products, our customers enjoyed our key cabinets so much that many have requested we also carry a version with keys. 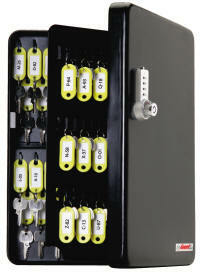 Our Key Cabinets come in 48 key hook and 122 key hook models. Included with the product is the mounting hardware and 24 and 64 key tags respectively. 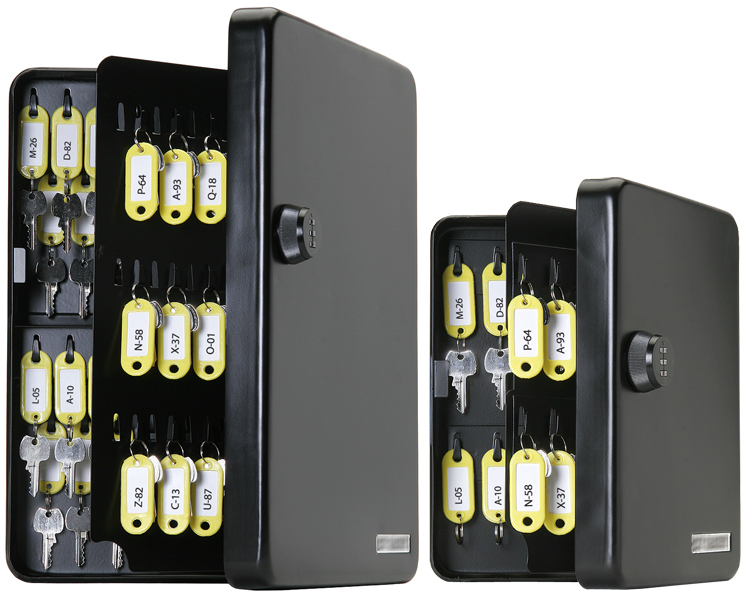 FJM Security’s durable KeyGuard® Electronic Key Cabinets are constructed entirely of heavy gauge steel, including the high capacity key hooks and continuous “piano” hinge. Mounting supplies and multi-colored key tags are included making it easy to install and easy to organize. 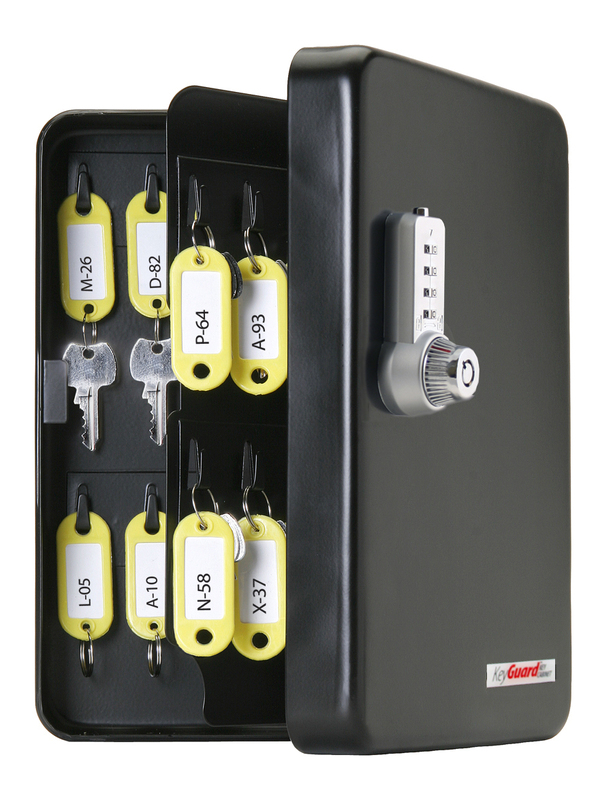 Available in 48 and 122 key models, the cabinets are secured by the Combi-Cam E lock, an electronic lock with up to 10,000 possible combinations and an environmental friendly battery life of up to 10 years! The solid metal, Combi-Cam E provides instant audio feedback with the convenience of programmable keyless access and a managerial/master code for dual access flexibility. 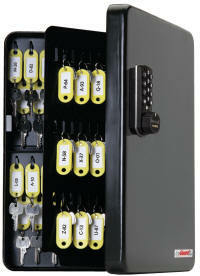 Open the electronic key cabinet any time a code is lost or forgotten and reset the combination. To download high resolution images of our product, go to http://www.combination-key-cabinet.com/press/ and click on the thumbnails at the bottom of the page to download high resolution images. 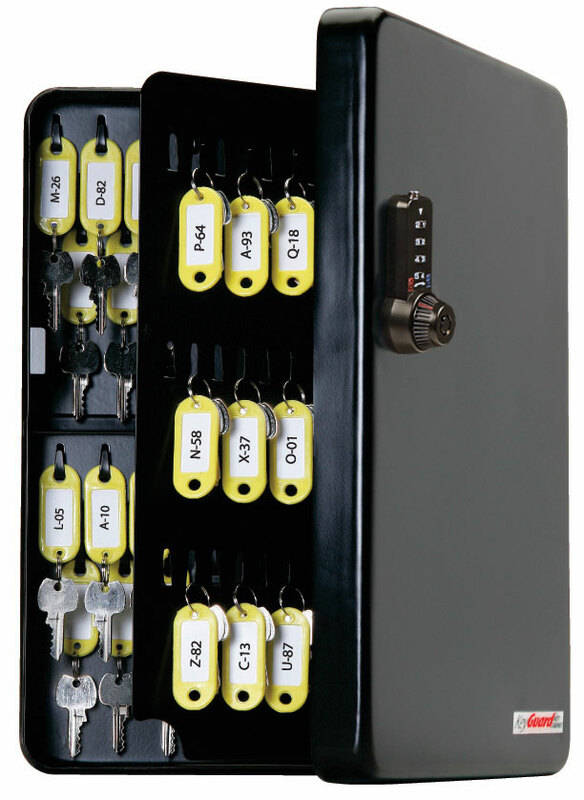 Dual Access Key Cabinets now available with black combination locks with key override. FJM Security Products announces the addition of the RFIDlock to its family of KeyGuard® Key Cabinets. All the Great Features of the Combi-Cam E with theAddition of RFID Card Access! Available in 48 and 122 key models, the cabinets are secured by theCombi-Cam E lock, an electronic lock with up to 10,000 possiblecombinations and an environmental friendly battery life of up to 8 years! The solid metal, Combi-Cam E provides instant audio feedback with the convenience of programmable keyless access and a managerial/master code for dual access flexibility. Provides RFID access via key card, fob or wristband. • Up to 8 year battery life! -No periodic battery change hassle! To download high resolution images of our product, go to http://www.combination-keycabinet.com/press/ and click on the thumbnails at the bottom of the page to download high resolution images.